Pastel Blue Bear-Shaped Picks. 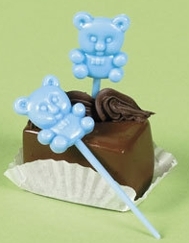 Give your buffet or cake table a festive baby shower look with these adorable pastel blue picks. Fun and easy to do, simply top off fruit slices, cheese trays, snacks, cupcakes and hors d'oeuvres with these bear-shaped plastic picks. Each 3" pick is topped with a blue bear.